We provide quality and objective counselling at choosing the best tyre for you with regard to your needs and style of driving. Our expert installation and balancing guarantee a safe, silent, comfort and shake-free drive. Our range of tyres covers the majority of manufacturers and we offer 1 year warranty for all tyres purchased at our shop. We keep the majority of the products in stock. 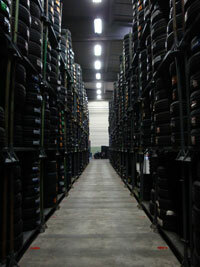 We even offer facilities for tyre-keeping.